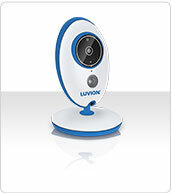 Separate camera for the Luvion Easy Plus baby video monitor. Please note that this camera only functions correctly with the Luvion Easy Plus and is not suitable for use with other models. The Luvion Easy Plus monitor can be connected to a maximum of 2 cameras at a time.